My Baby Bear has a crush. I don't think he knows it's a crush, but he does have a certain fondness for this gal. It probably has something to do with how much of a momma's boy he is and the amount of time I spend trying to keep him as my baby. 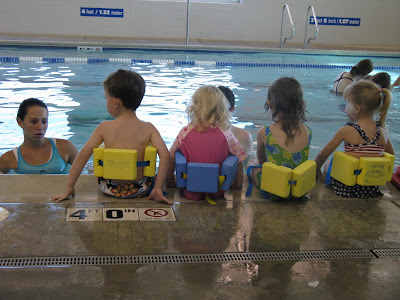 At swimming lessons, the class is instructed by two teachers; one female and one male. The first couple of lessons there was a hint of a crush, but because he was spending so much time out of the pool dancing, it was hard to make a final call. This past week, he straight up refused to get in the pool with the boy instructor. It wasn't that he started pitching a fit over it. He would sweetly point to the girl instructor every time it was his turn to get in the water. He even elected to give up a couple of turns because she was with other kids. A went over and tried to coach him into the water with the boy instructor, and Baby Bear politely remarked, "No, I'll wait for her." Towards the end of the class, he would work with the boy as long as the girl instructor did the hand off. I feel so bad for the boy instructor. I'm sure he's a good kid. We've started talking about the instructors at home to prep Baby Bear for next week by saying things like, both of your teachers are so nice. He still insists he will only work with the girl. At least we are trying.